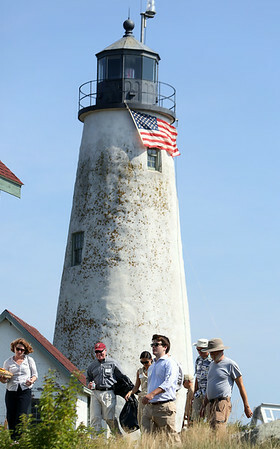 Members of the Essex National Heritage Commission, and General Services Administration file past the lighthouse on Bakers Island following a short ceremony in which the deed for part of the island was transferred from the US Coast Guard to the Essex National Heritage Commission. DAVID LE/Staff photo. 8/27/14.